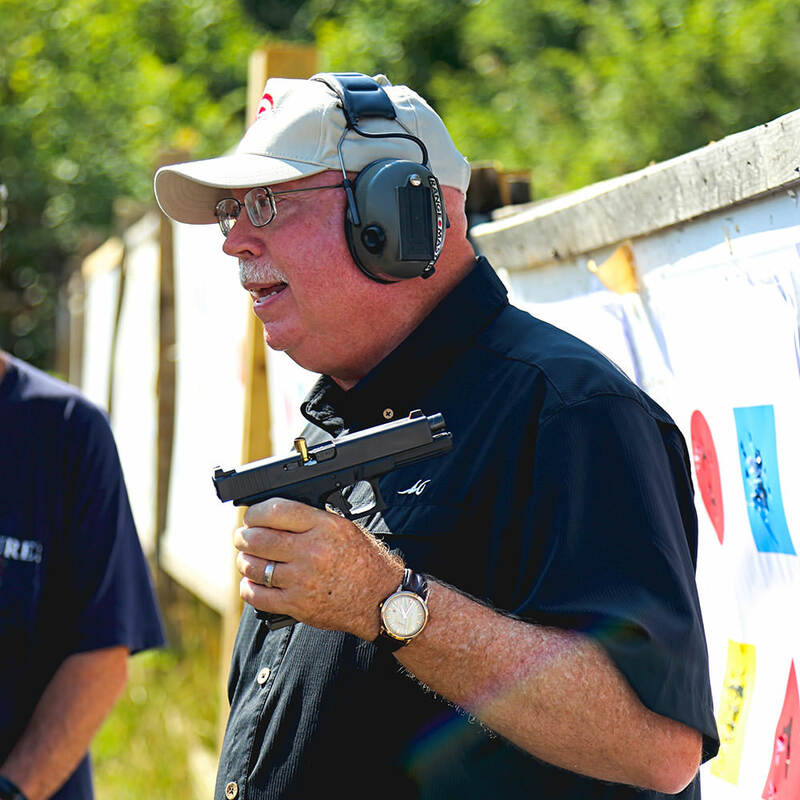 I have long read Tom Givens Rangemaster newsletter, I post them often on this site, and I knew that his iconic level Rangemaster class was on my list of "must attends". I wanted to take this class specifically because I knew Tom teaches some of the same concepts which I am very familiar with, just in a different presentation. After finishing this class, I can easily see why he has a winning record of students using deadly force in real world confrontations. The concepts were hammered home repeatedly and concisely. 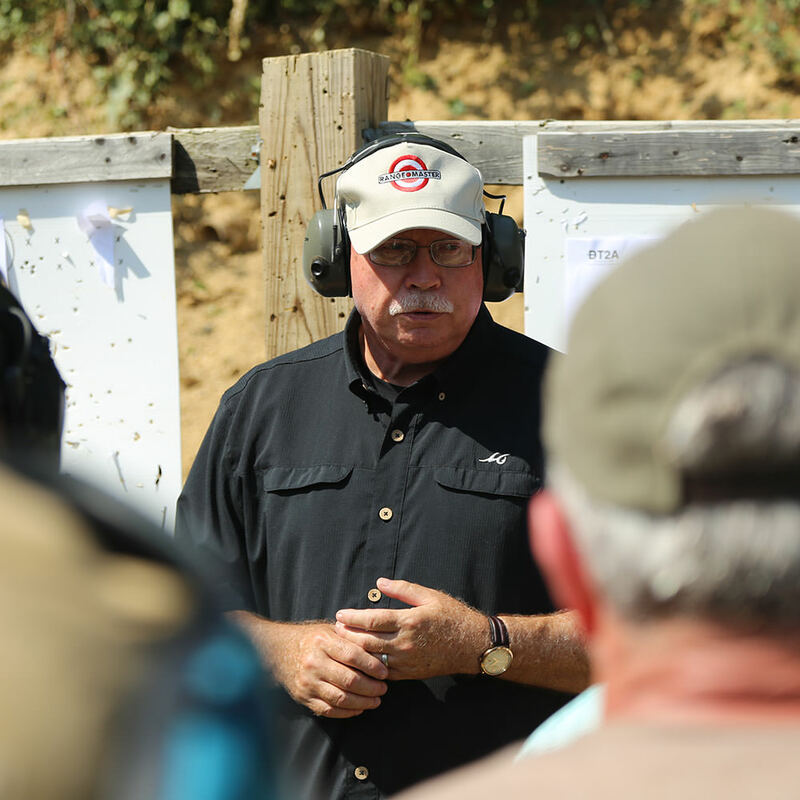 While this class was not a tactical class, that is not a detriment, it is specifically designed so that Tom can provide the students a specific focus on concepts and a primer on skill sets he believes will suit them the best in the real world. Tom was nice enough to let me audit the class and I brought my camera along. 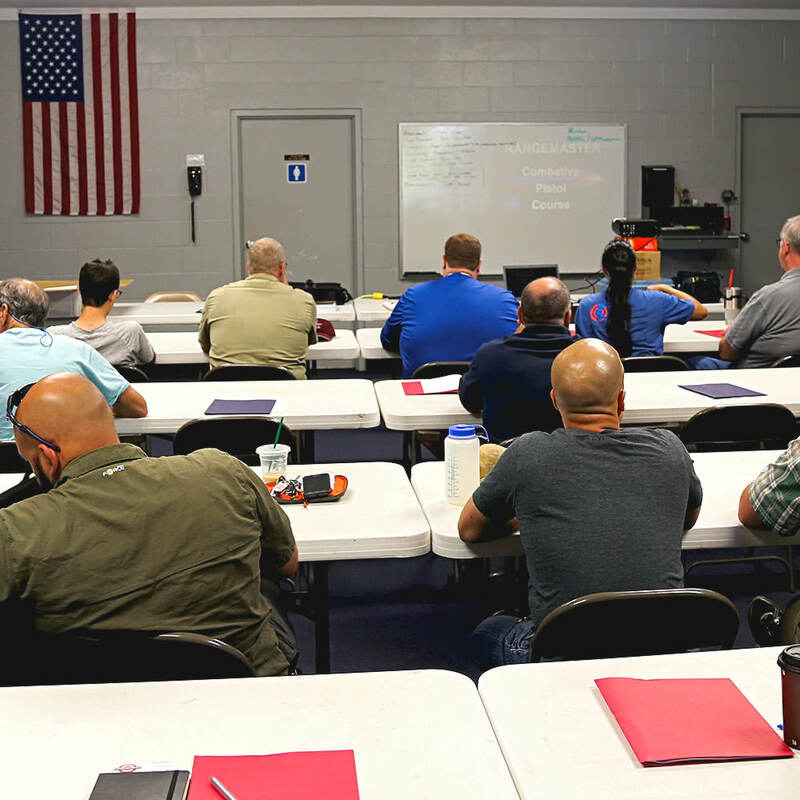 The class was extremely structured and those of us who are constantly training with various instructors can easily tell that the material has been fine tuned to provide the best possible combination of information for the time allowed. We started off the day in the classroom, with Tom having a power point presentation on the wall. Tom explained some of what we can expect throughout the next two days and that he believes having a classroom portion to show exactly what the students will be doing is important. Every student was given a red folder with a lot of material to reference, I am using that folder as I am typing up this AAR, as well as, my notes for the class. 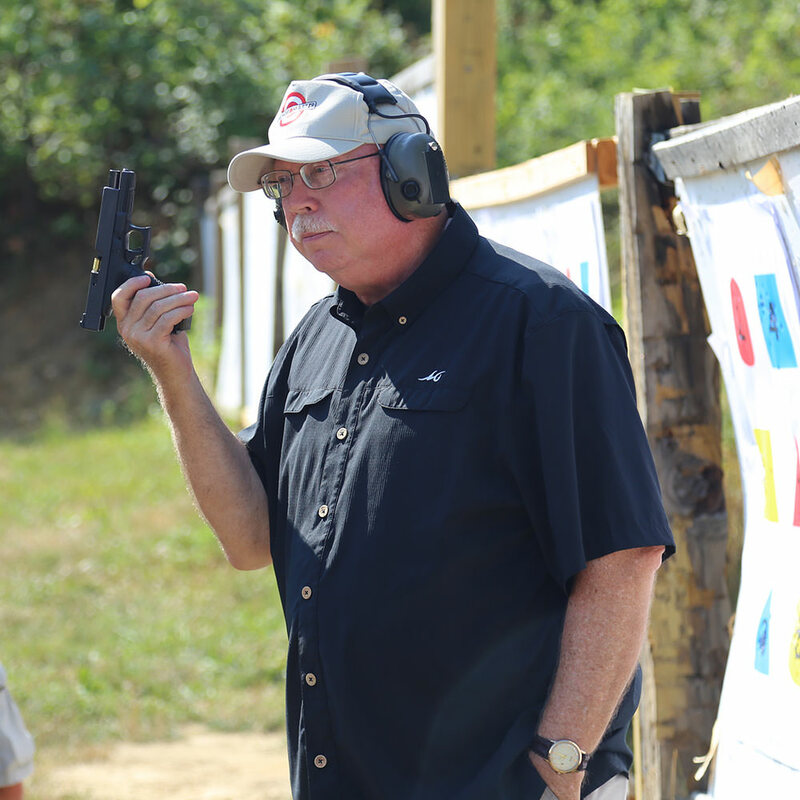 Tom went over various pistol related concepts and used a Power Point presentation to do so. This part was short and gave a general overview of what he intended to cover, this is good because death by power-point is a very real thing. 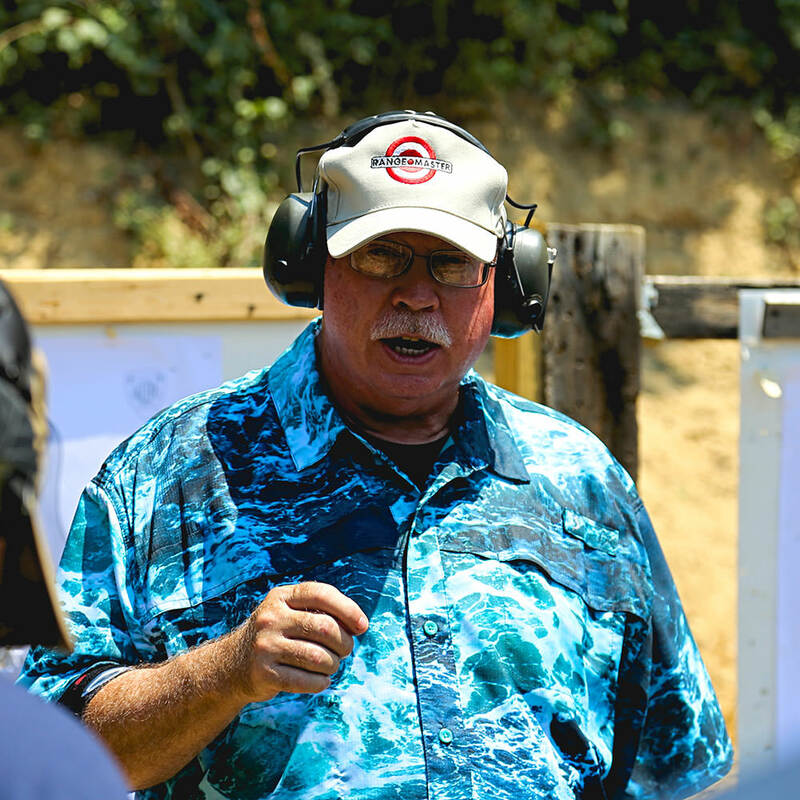 Tom went over his life experience, including his 25 years in LE and his firearms instructing pedigree, along with some of his personal beliefs on the subject of firearms from his experience instructing. 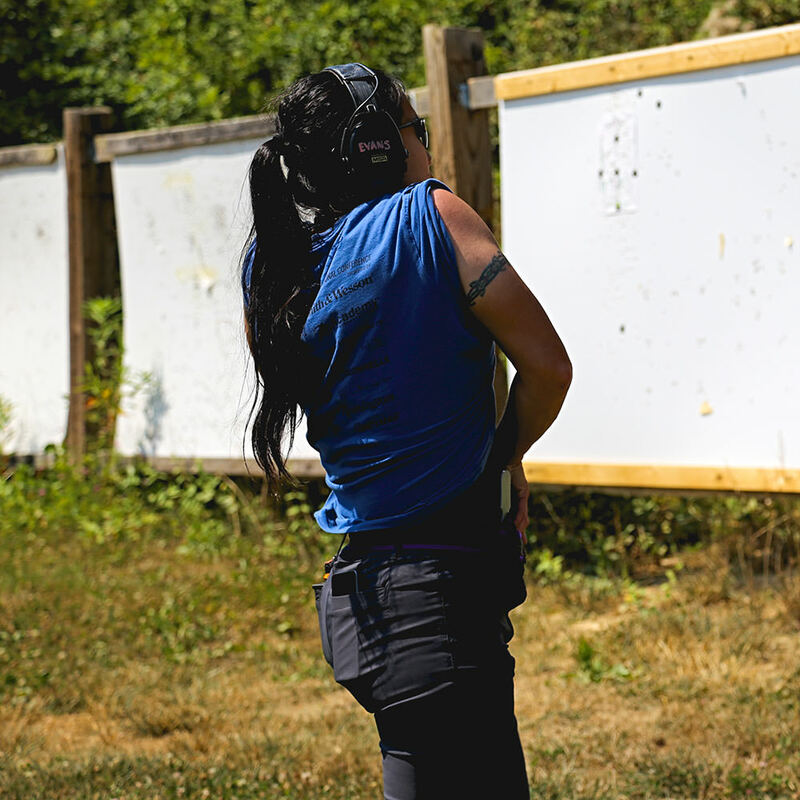 We had a quick lunch and then spent the rest of the day outside on the range. 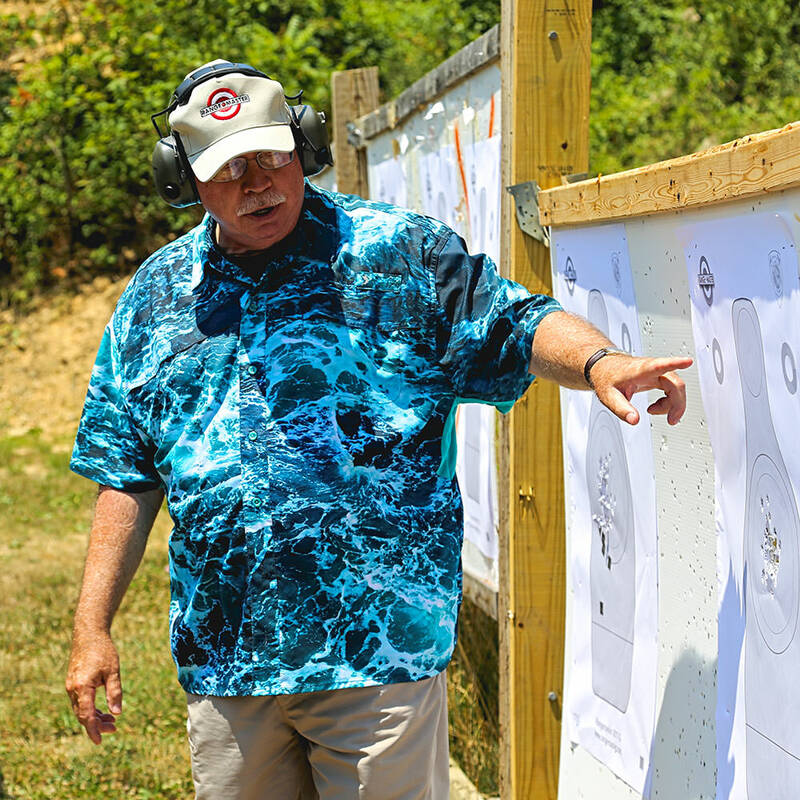 We went outside after the power point and Tom explained aiming and target concepts. Talking about specific areas where everyone should be aiming because of how people actually win gunfights. The Tom went over various drawing from the holster methodology. This is something that is usually done later on in a class, Tom explains it first. 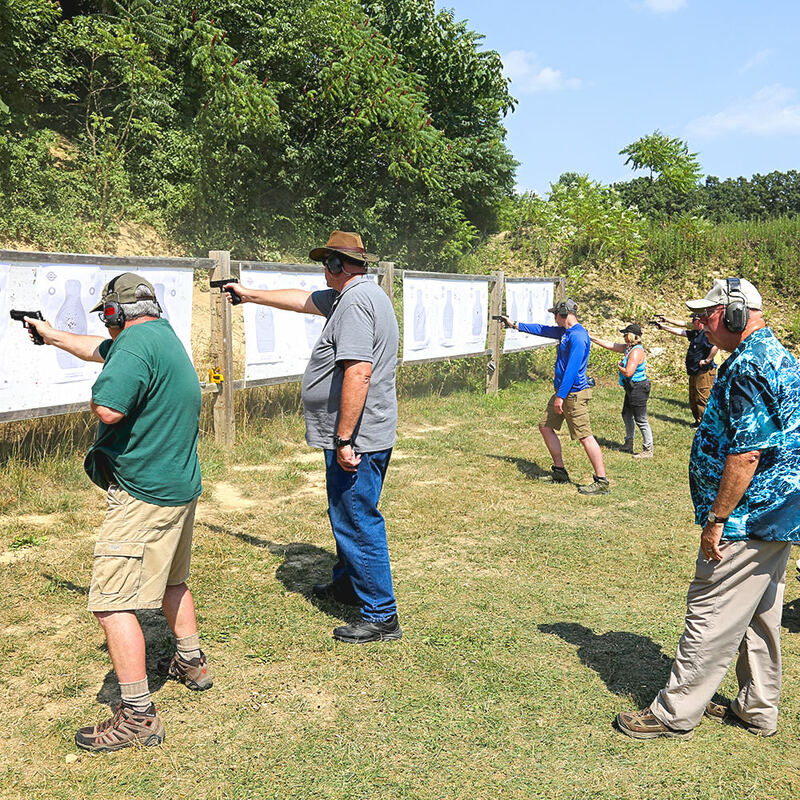 The students then did a few different drills which included drawing from the holster using the two hand method of drawing (one hand grips shirt, one the gun). 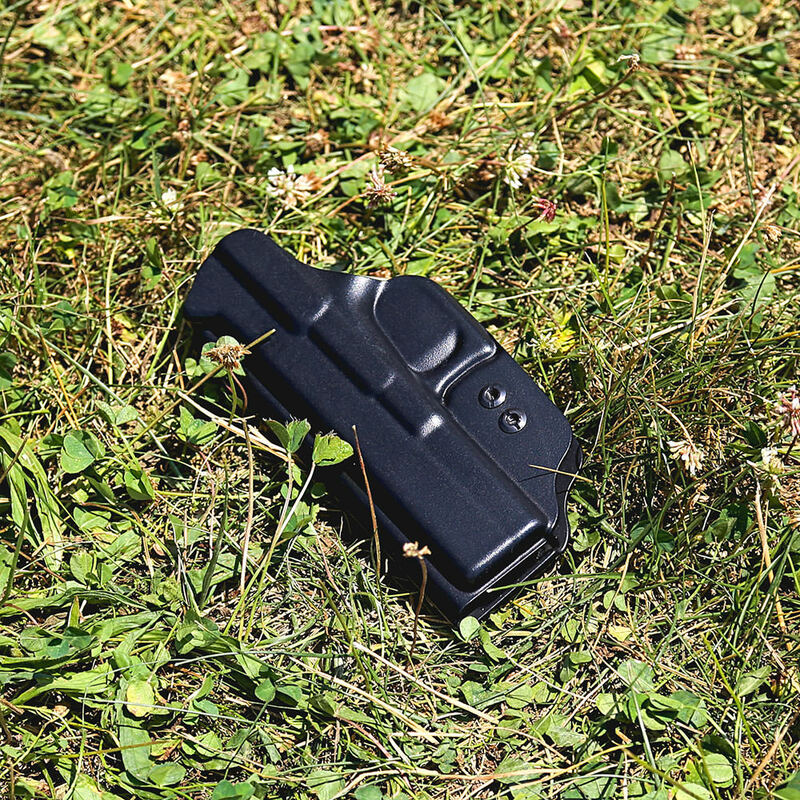 During which there was a holster casualty. 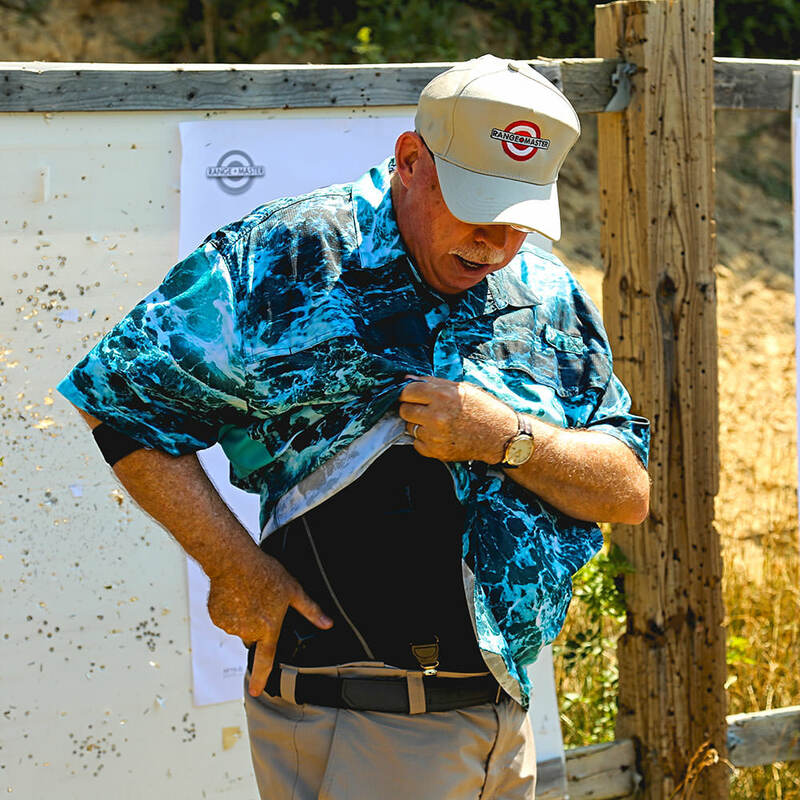 If I remember properly it was a cheap thin holster with a cheap plastic clip on it which came out and flew down range when the student drew. 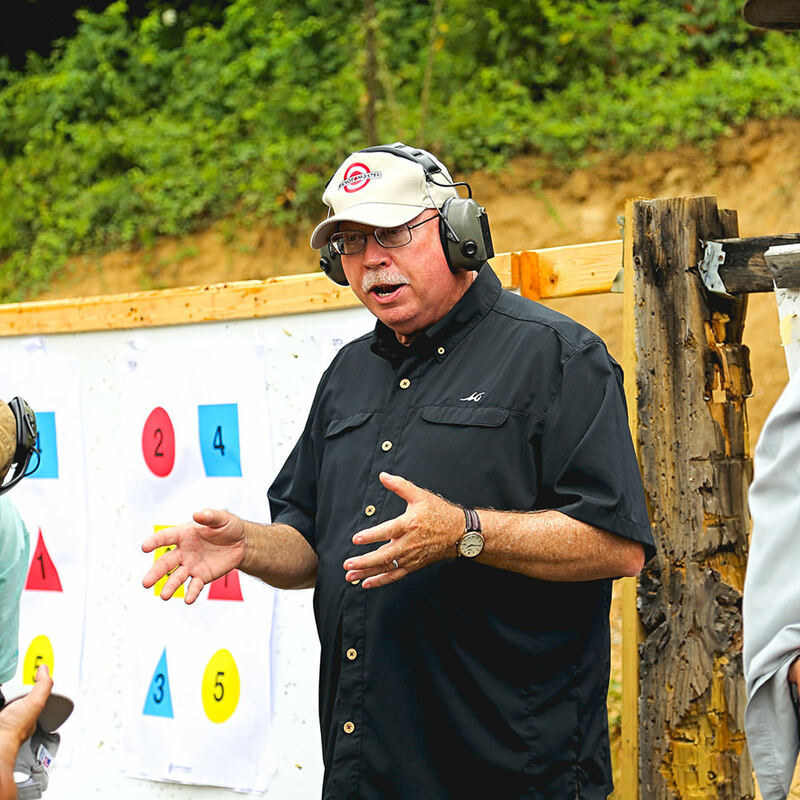 Tom went on to explain reloading. Then the students ran a bunch of drills. 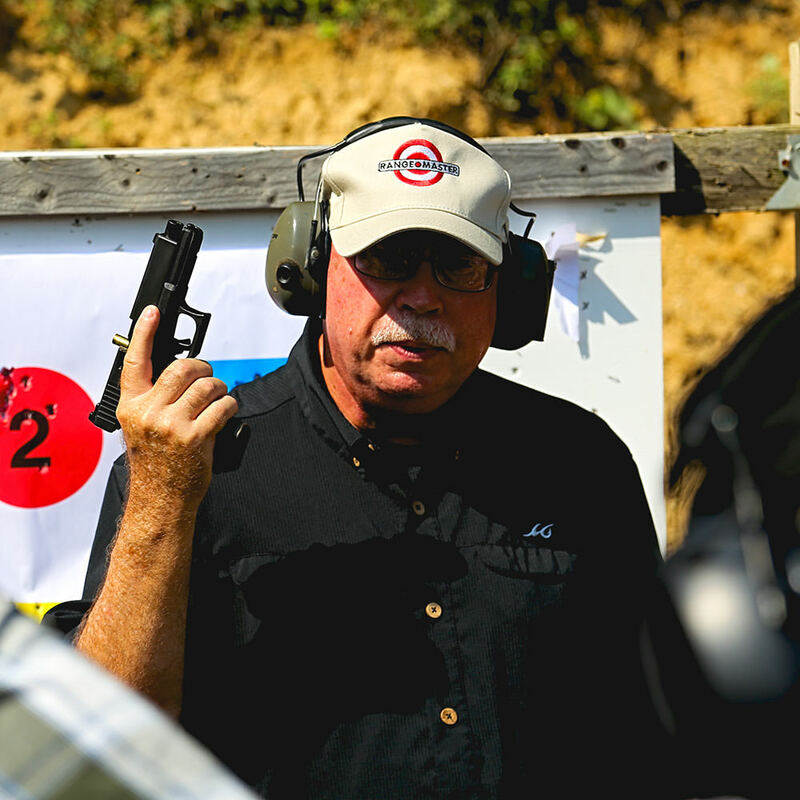 Tom went over sight alignment and trigger manipulation in relation to sight alignment with follow-up shots. Then the students ran some drills to work through those concepts. 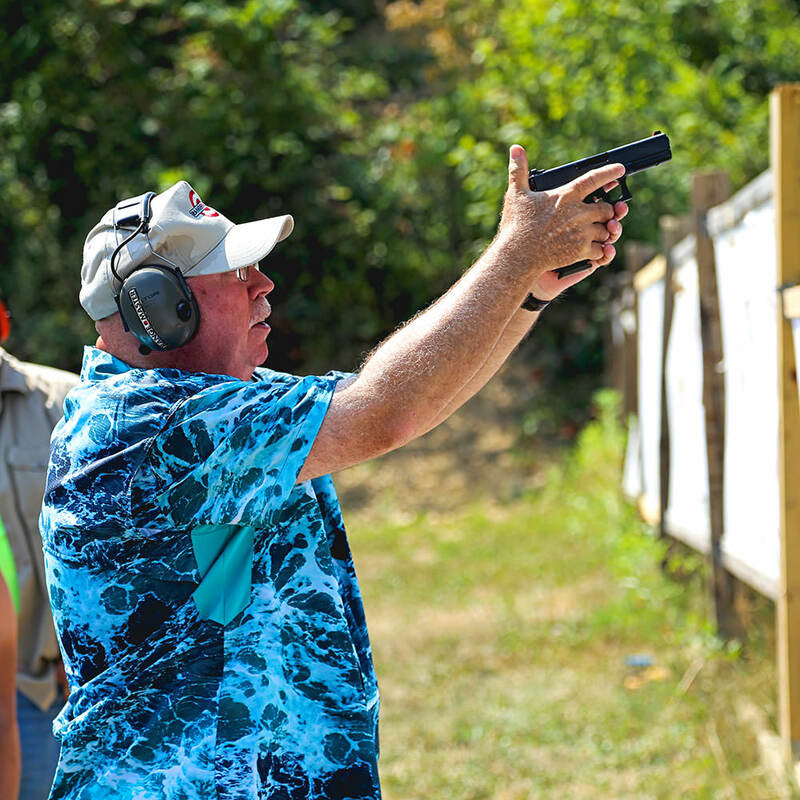 Tom explained pistol manipulation, he prefers a full hand grip on the slide to rack it. 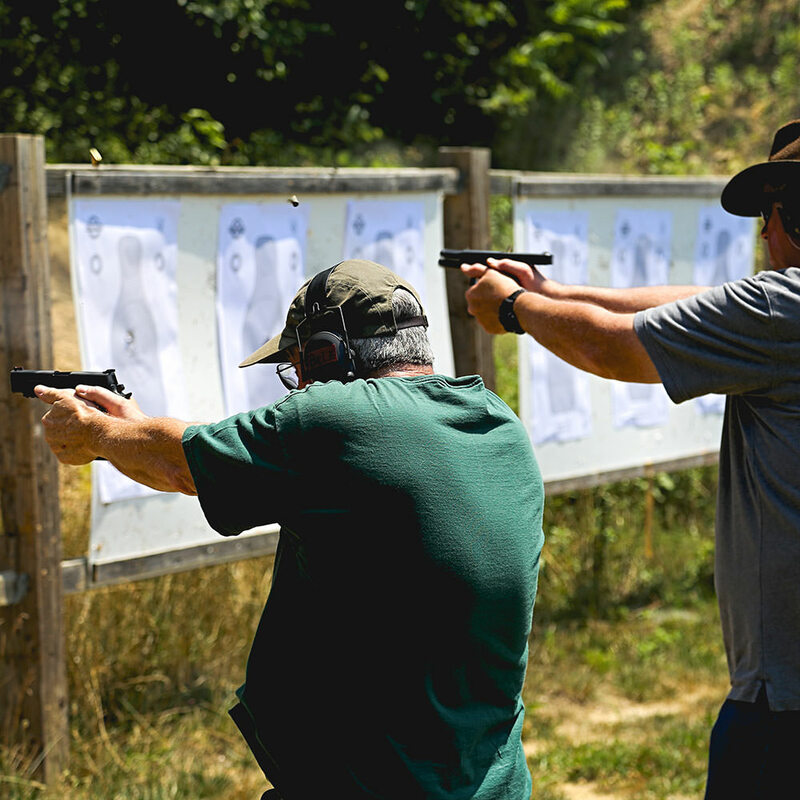 The students then were given the opportunity to setup the need to rack the slide of their pistols. Tom was constantly walking around, with the help of his AI's to make sure everyone was doing what they were supposed to. This class was extremely structured in this way as to prevent anyone from straying off or doing things which they should not have been doing. 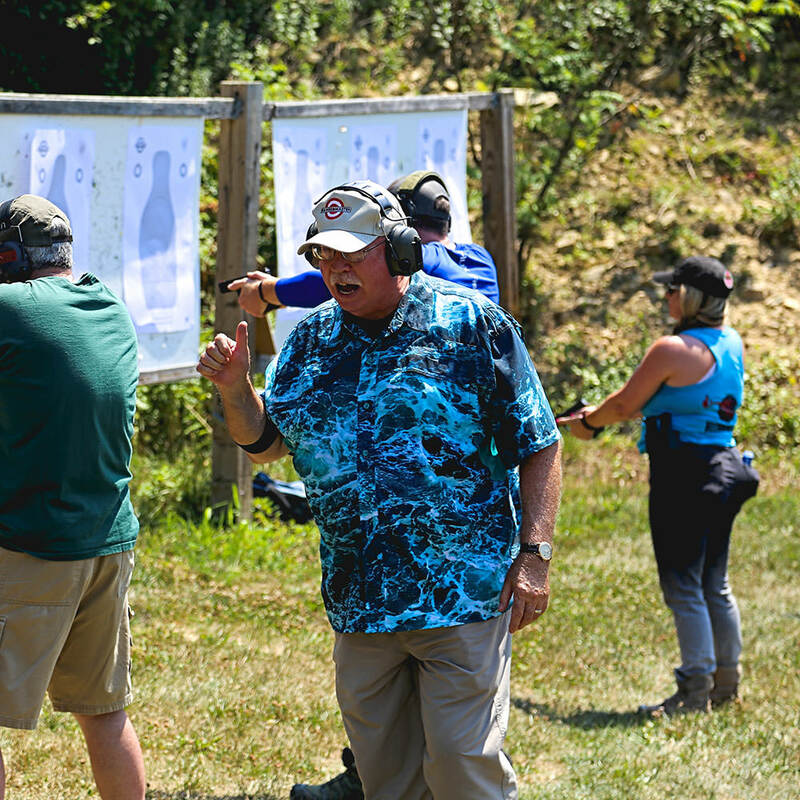 Tom would stop the class to talk about certain topics, as they presented themselves, usually having to do with accuracy and speed of the shot in relation to the target. 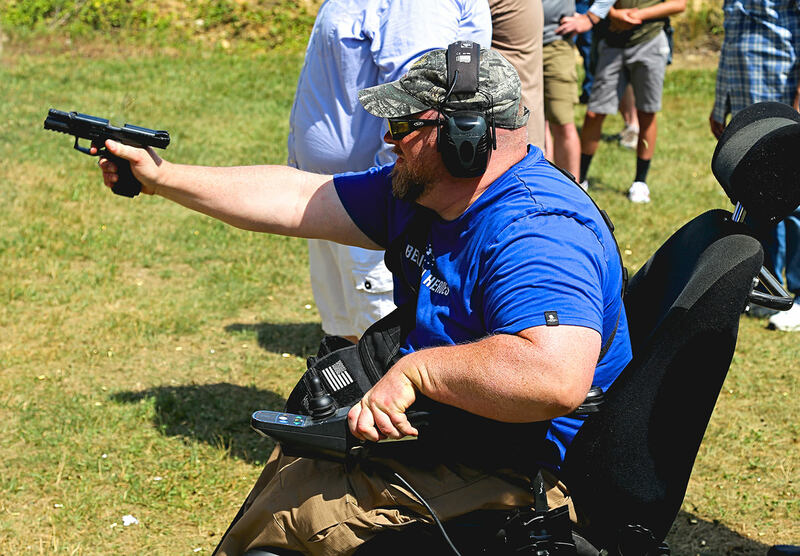 He went over one hand shooting and how to properly (and safely) transition from your right to left hand, and backwards. 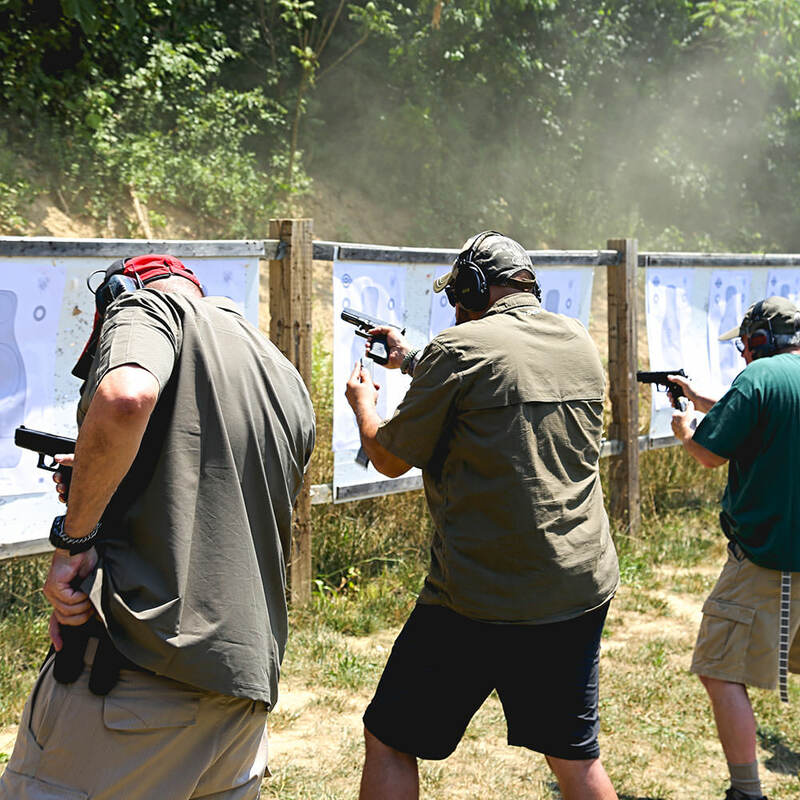 Each student then had several iterations of drills to shoot single handed. 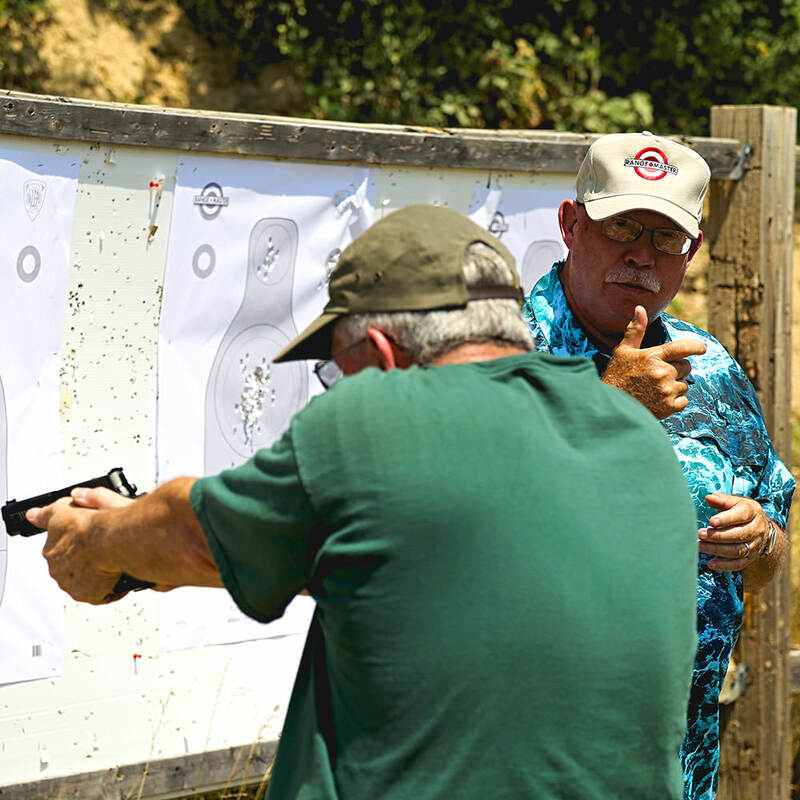 Tom showed a buddy drill where we racked the slide for the shooter, and vise versa, in order to remove certain variables which occur to move our hands while we shoot, stressing finger placement on the trigger. 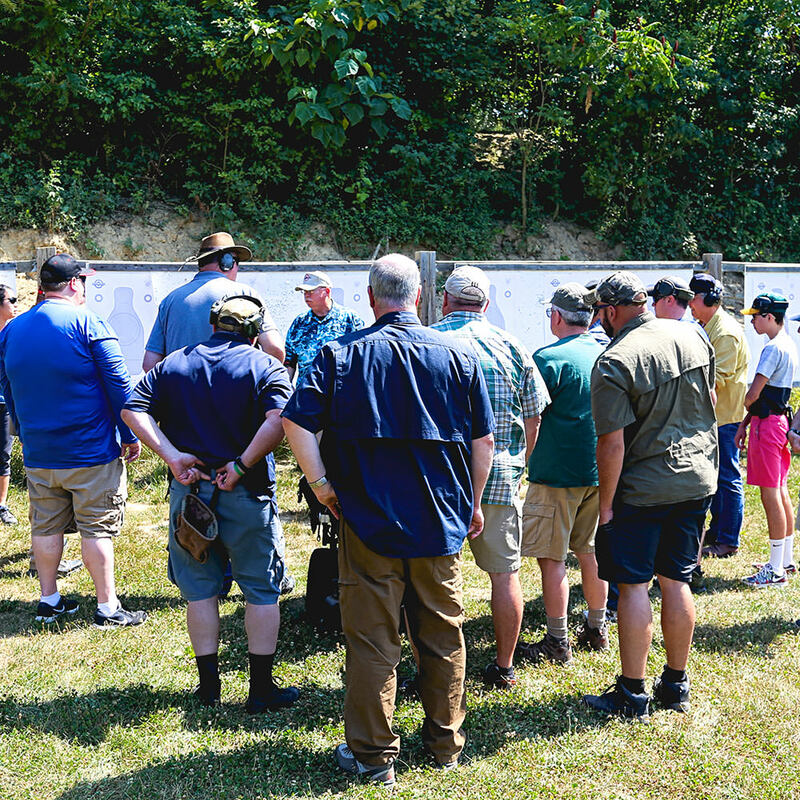 Tom then explained the qualification drill he runs, which included drawing from the holster, shoot quickly and reloading. 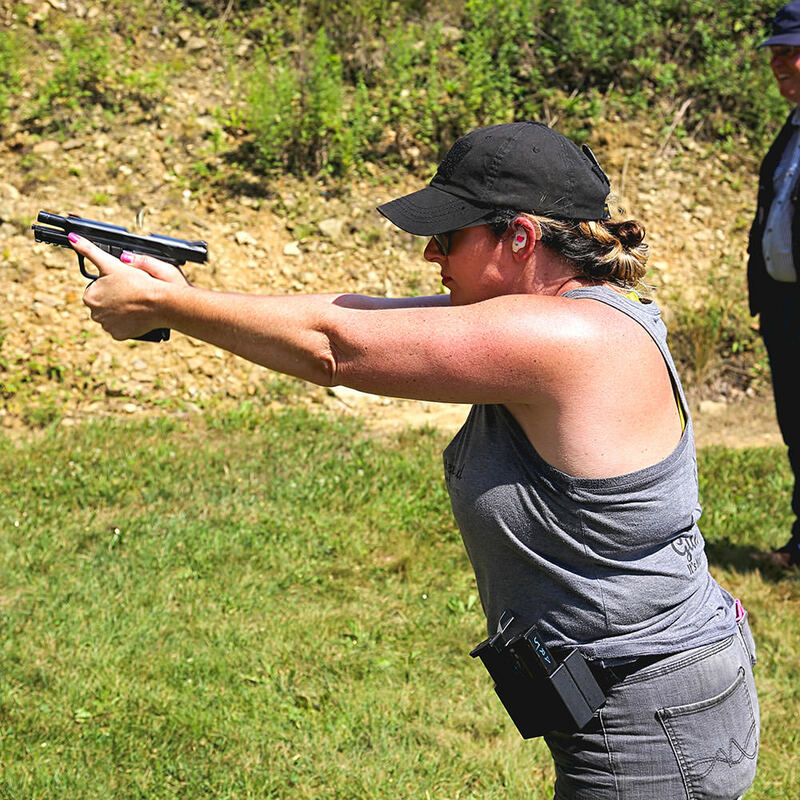 This drill included several 15 yard shots which was probably the first time some of the students ever shot a pistol out to 15 yards. The students then ran through the qual. We finished up with this qual. 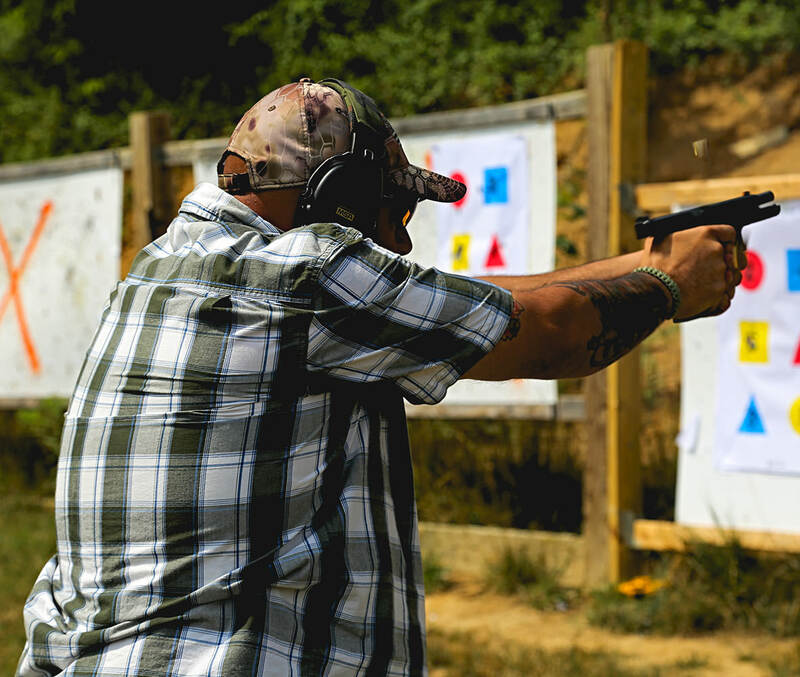 Reflecting back on the day I posted a few issues I had with some magazines during the day, primarily with ETS and Magpul magazines which were dropped still containing ammunition. 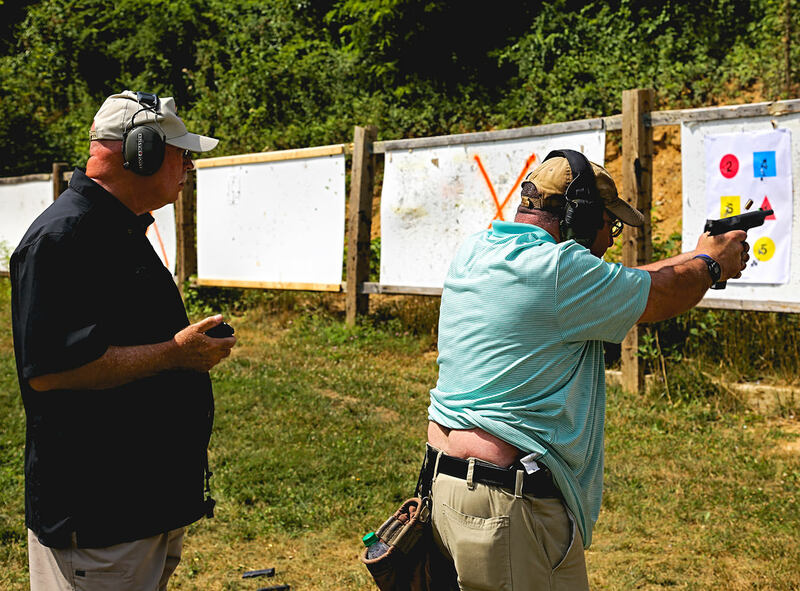 This was the first time I experienced these issues with these magazines, I have since labeled and kept them in my "training only" pile of magazines. The second day morning start off with a power-point presentation to get everyone in the right frame of mind. Tom went over numerous real world examples of violence, from indiscriminate violent crime against innocent persons for no apparent reason, to targeting of business owners, including those who would not accept victim-hood, and those who do accept victim-hood. The content Tom covered easily conveyed the concepts he wanted the students to understand. 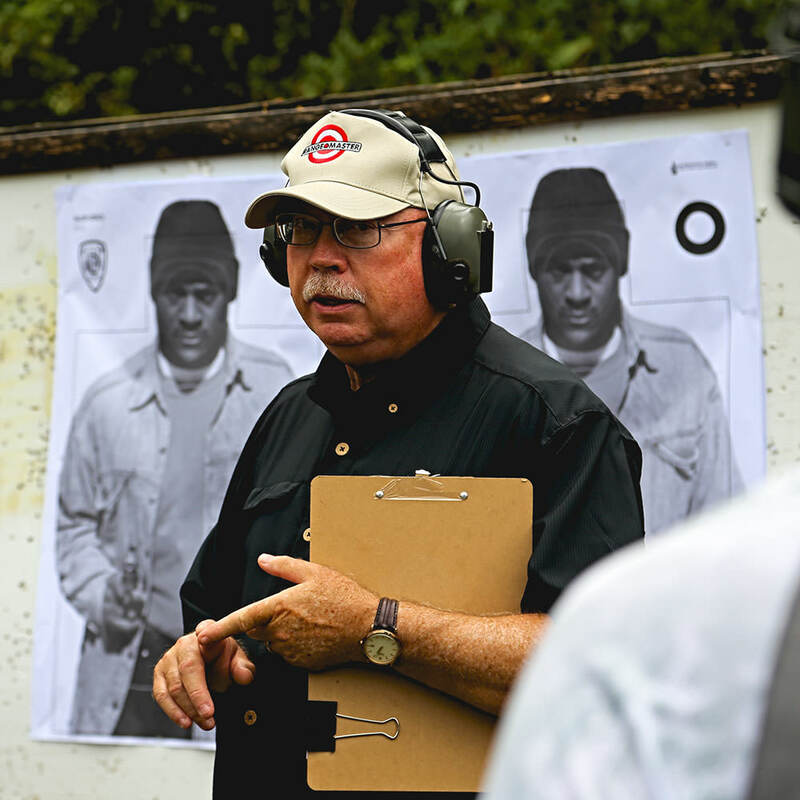 One occurrence he went over in detail was the 1986 FBI Miami gunfight, covering a lot of very specific aspects of it in order to better help everyone understand the nuances which the students could take away and apply in their everyday lives. It is extremely important to remember our past in order to understand the how and the why of what we do today. After finishing the classroom section we were going to go outside on the range but we got completely crushed by rain, to the point it was not conducive to learning. 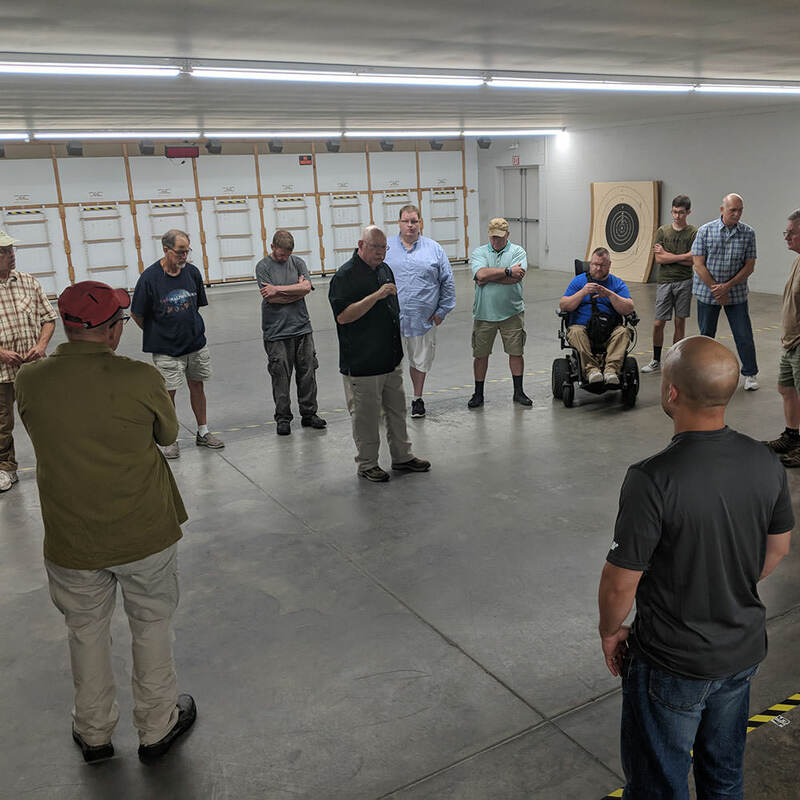 We took a break and then went into the indoor range to talk about drawing from concealment, various types of concealment garments and then to do some guided dryfire. 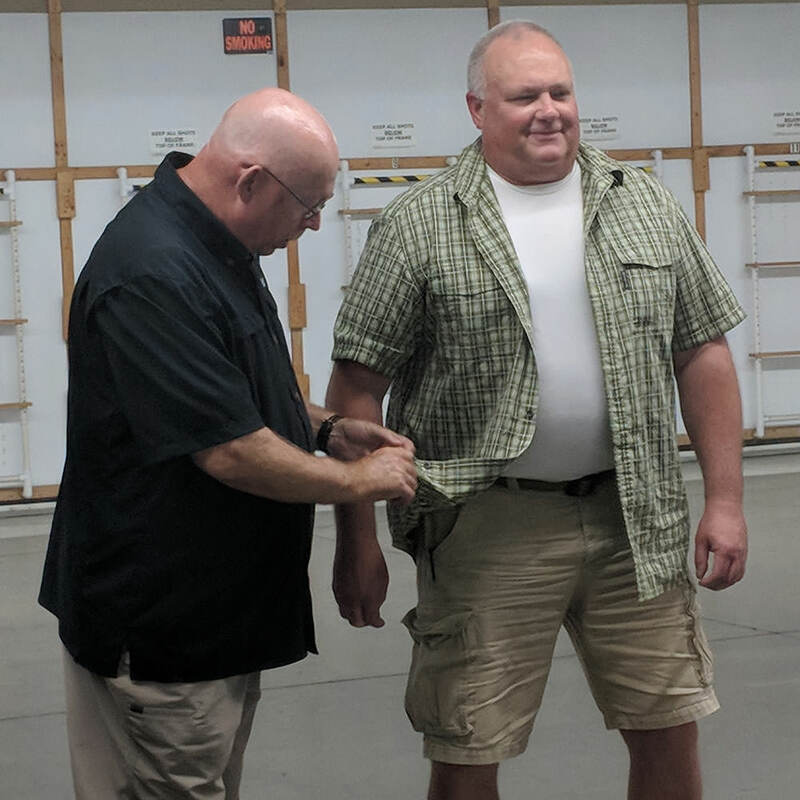 Tom went over various materials, types of draw strokes regarding those materials and various concepts for concealed carry. 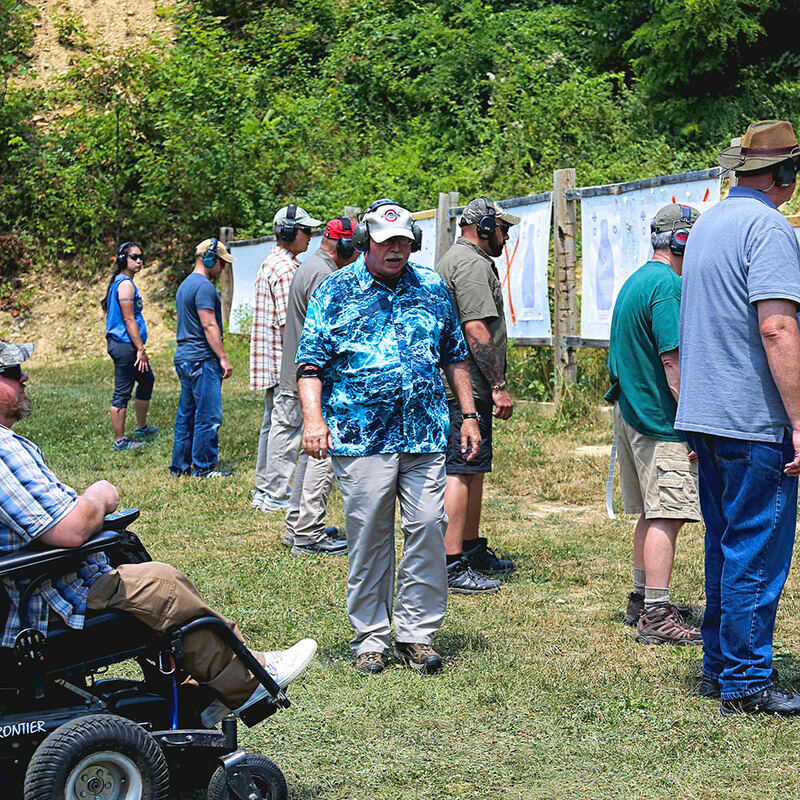 Once it cleared up and after we ate lunch, we headed outside and stayed on the range for the rest of the afternoon. 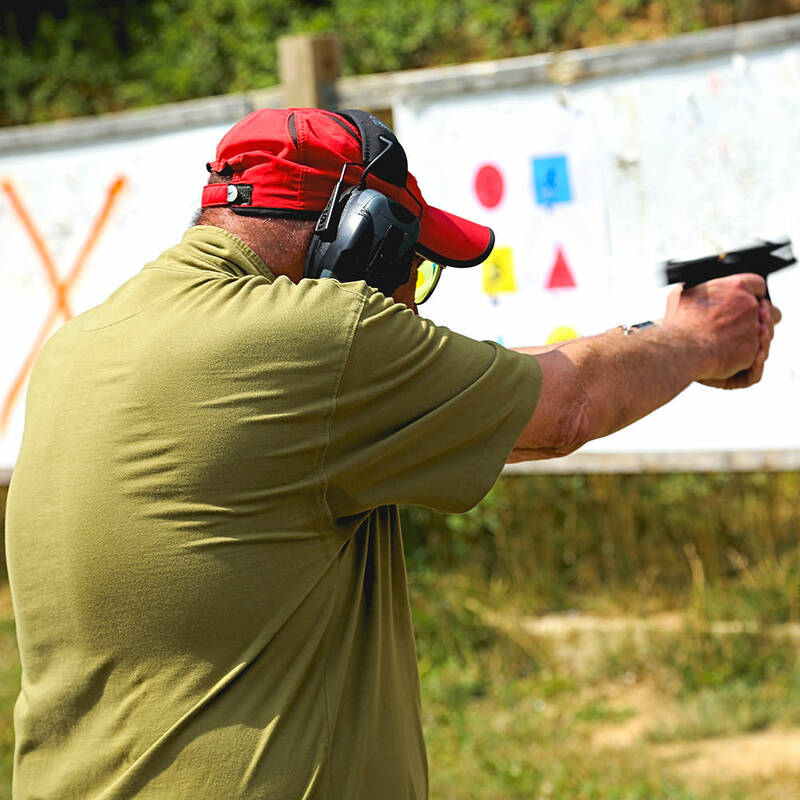 Once we got on the range, Tom had us put up a realistic target and explained the qualification, as it reflected something which every student may experience in their daily lives, since there have been students who have actually experienced it and survived. The students then shot the qual. 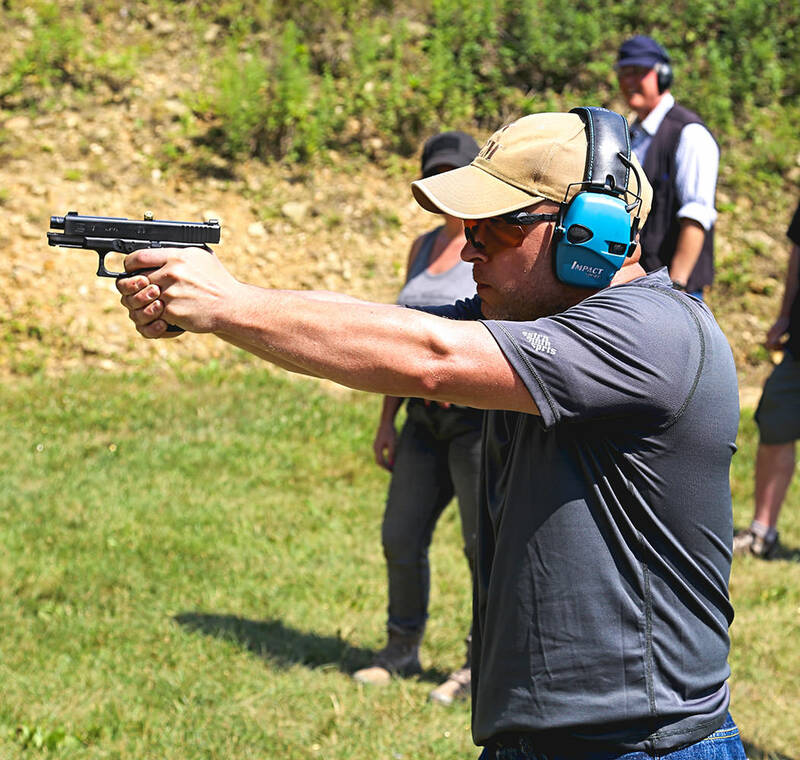 Tom yelled verbal commands for this qual, since there are no shot timer buzzers in reality. 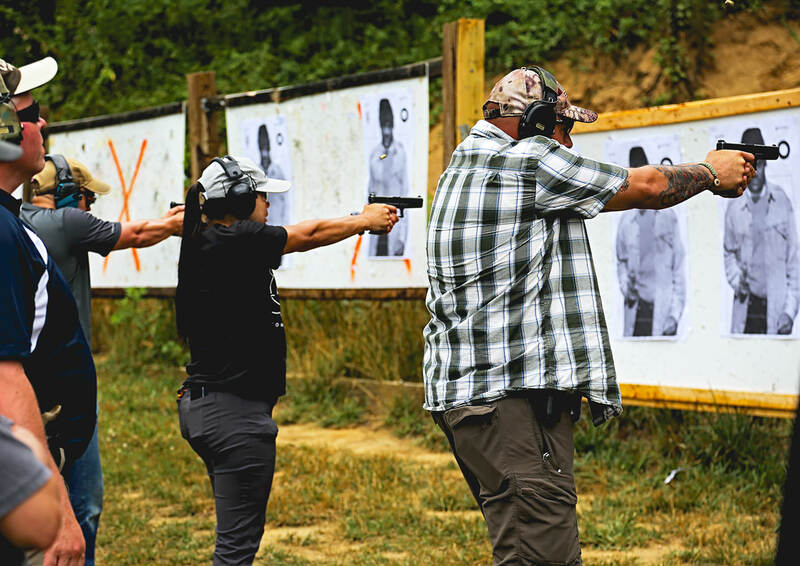 The students ran numerous iterations of person targets. Afterward Tom spoke at length about the thinking that goes on during a gunfight and he led the students to a variation on the Casino Drill. 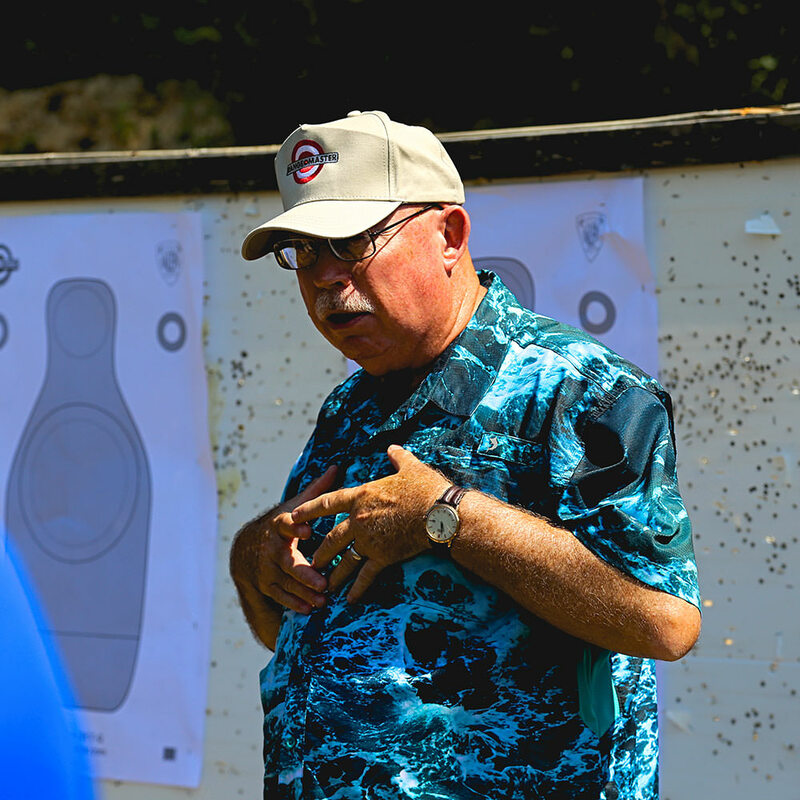 Tom wanted every student to understand that thinking is very important and simply shooting a target on the range does not create room to think about what you are doing. Giving you problems to solve mentally open the door to thinking about the problem and not thinking about the shooting. The Casino Drill targets were setup and every student ran through them several times with the group, then every student was given a chance to embarrass themselves individually while everyone watched. 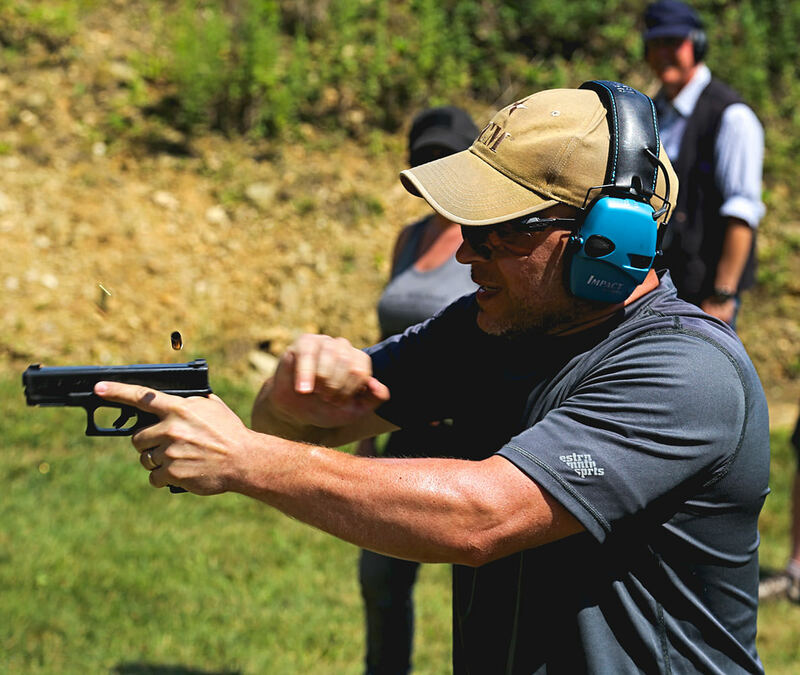 Tom kept a close eye while the students ran this drill. 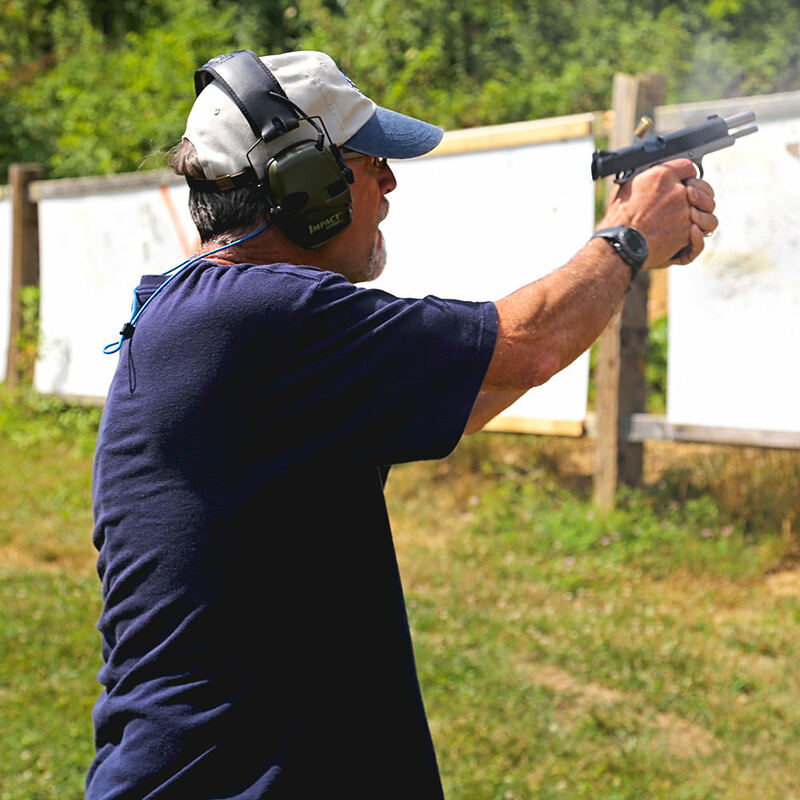 One of the students had a stove pipe which he immediately cleared and went back to shooting. Tom made sure everyone had their go at it. The stove pipe which occurred prompted Tom to get into the various types of malfunction clears which could present themselves, and how to quickly clear them. 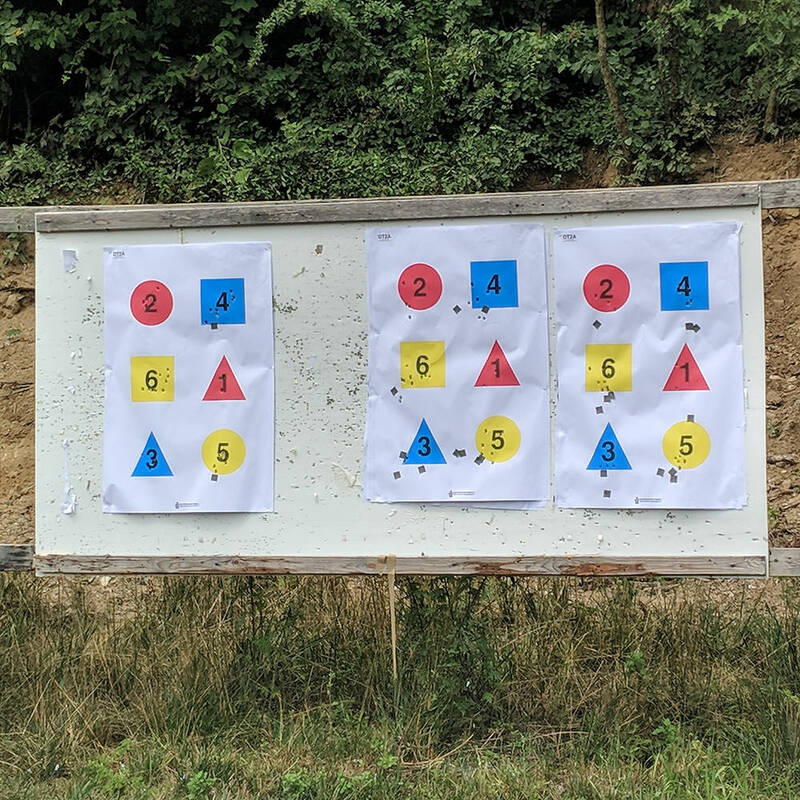 After Tom's explanation everyone continued to shoot the Casino targets which were already up, once we finished this there was a head to head shoot out for who can run the drill fastest with the least amount of misses (none, in order to qualify at all). That was fun. We then put up brand new targets for the final qualification which Tom explained. 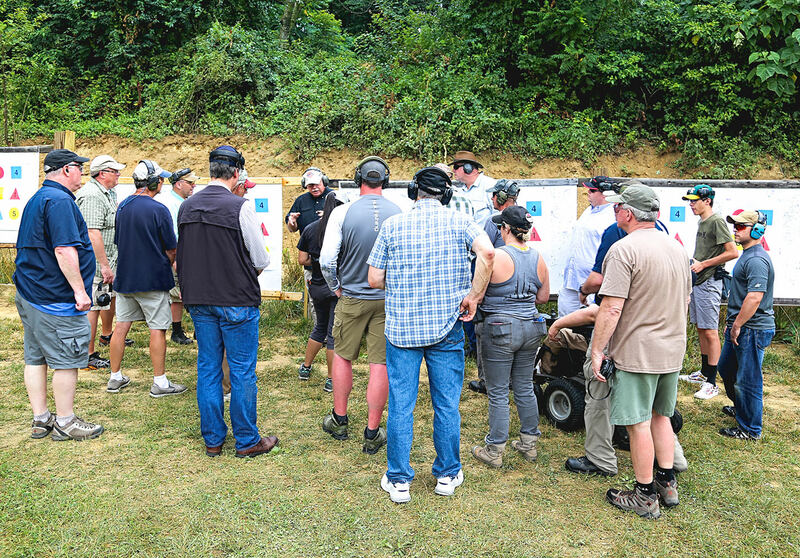 The ending qualification shoot was pretty straight forward, several types of shooting, under time pressure, at various distance no greater than 15 yards. 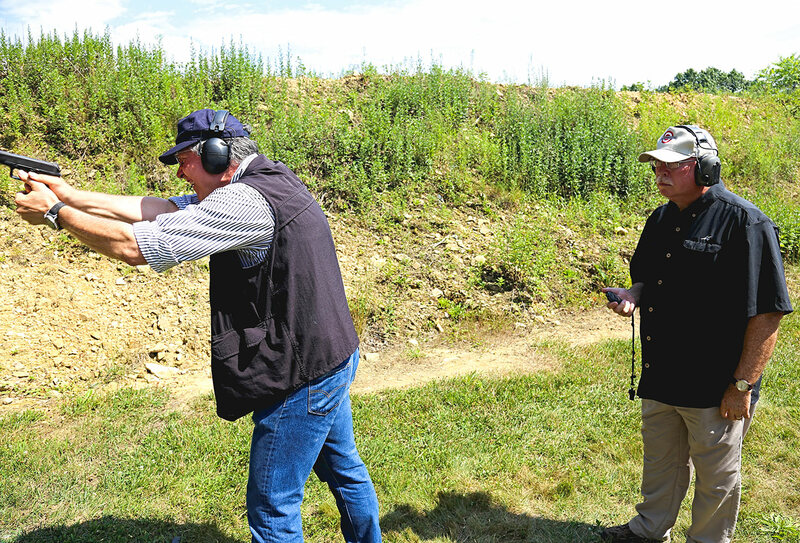 This qualification was more of a competency qualification than anything, if you shot it really well then you should shoot more challenging drills with harsher time requirements. 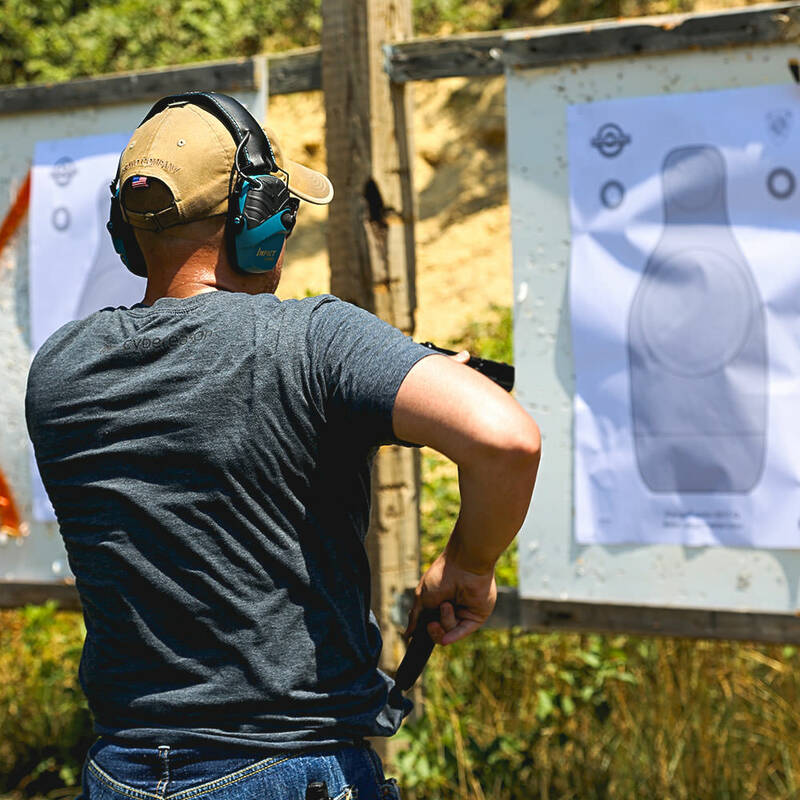 If you did not shoot this qualification well then you know where you stand and know what you need to improve in order to do progress. Below is my final qualification target after completing the course. Tom and I share a lot of the same concepts, and experiences, we just use different words to describe them. Tom focuses on tried and true concepts and methods. 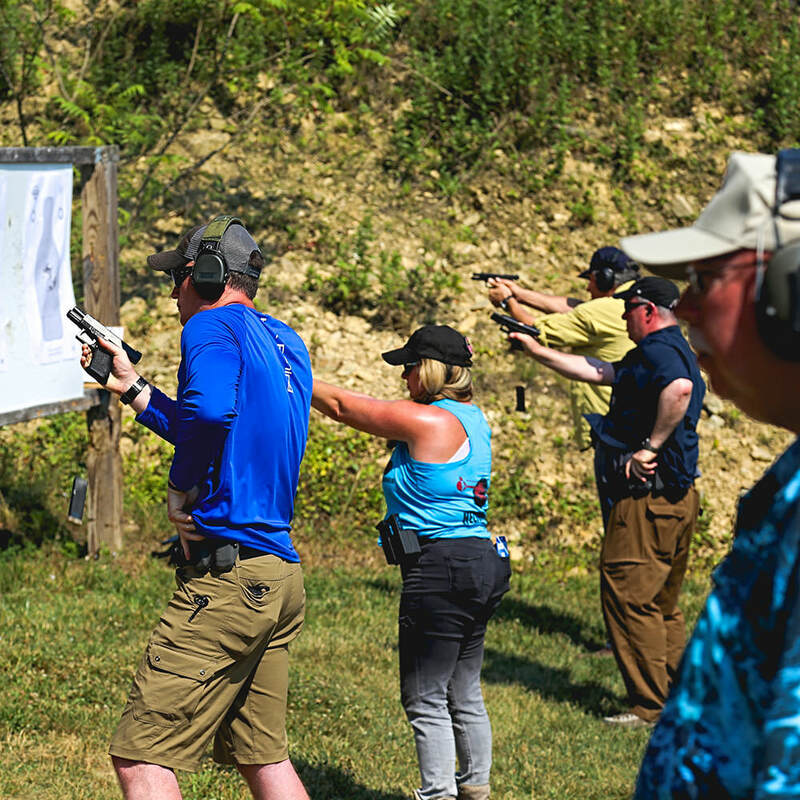 This class is definitely a class I would recommend for those who have never carried a pistol and want a harsh primer into the various skillsets and/or mindset required for doing so. 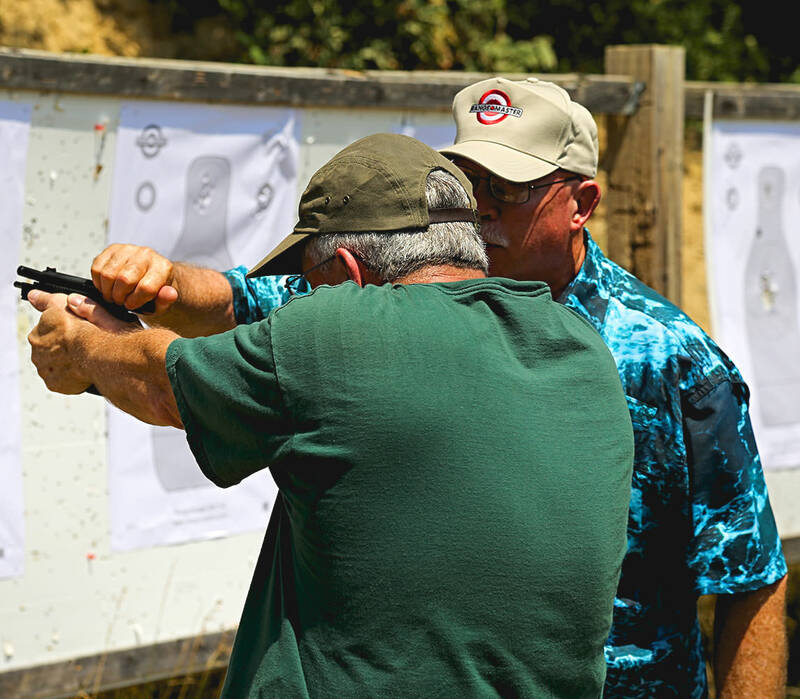 This particular class is not an advanced class, and while it was challenging at times, it was not designed around very advanced and high speed drills. The concepts in this class, specifically dealing with anti-victim hood and violence statistics are easily worth the price of admission alone, the lecture Tom gives can be a stand alone class. Tom provides the concepts which are fundamentally required in order to drive the average person to thinking about the hard truths of reality and reflecting them in their training. 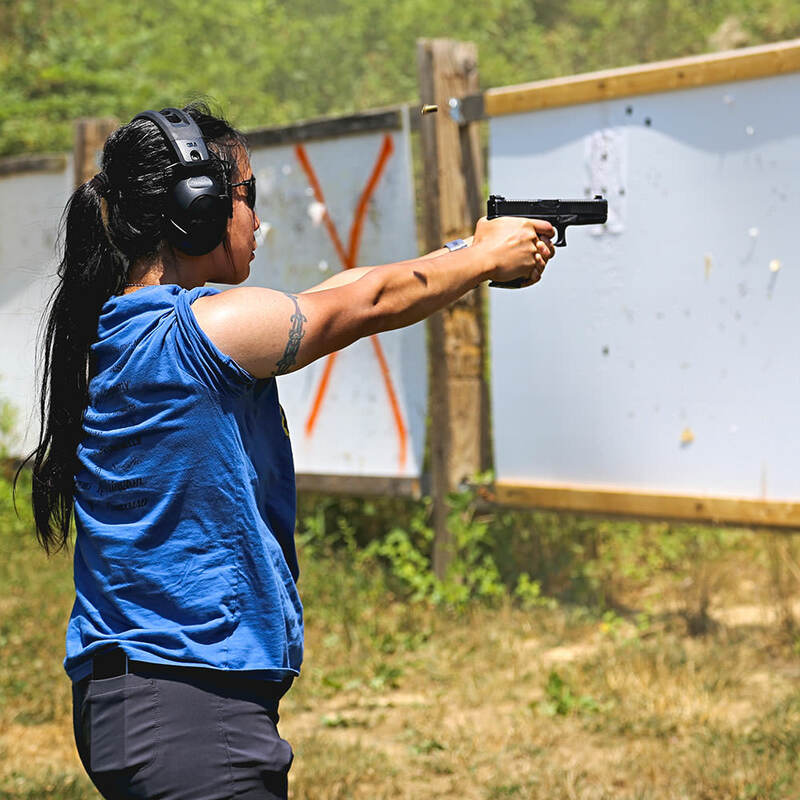 What is training without a reason to do it? Tom provides more than enough reasons, backed up by facts and indisputable evidence. Tom is very matter of fact with his instruction because he has seen a lot of students and has been a self described student of instruction for decades. 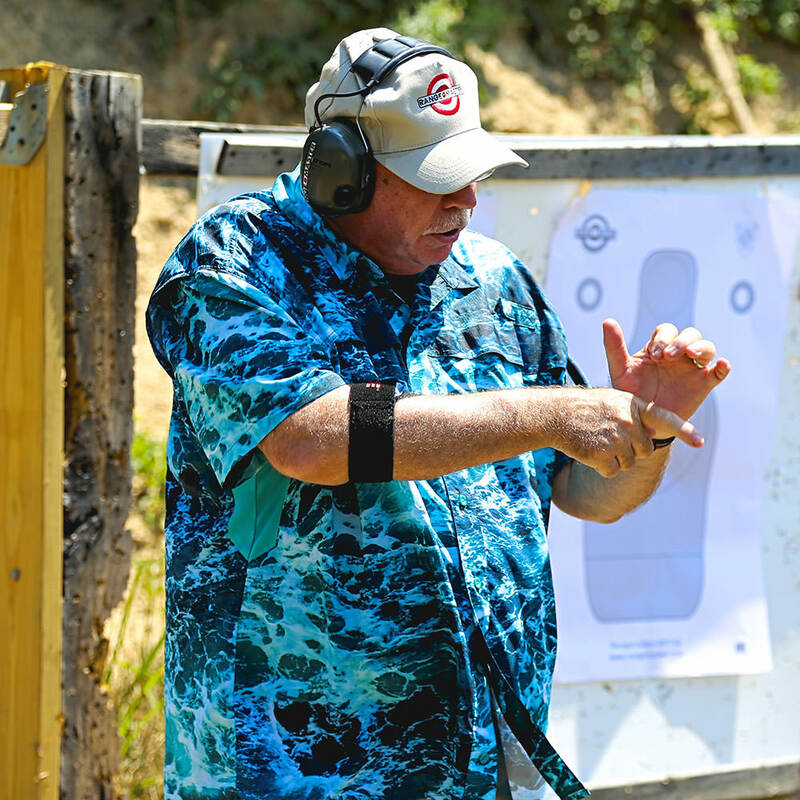 This has matured his style into a methodically qualified and skilled instructor. His teaching style is very applicable to the harsh reality which awaits his students. 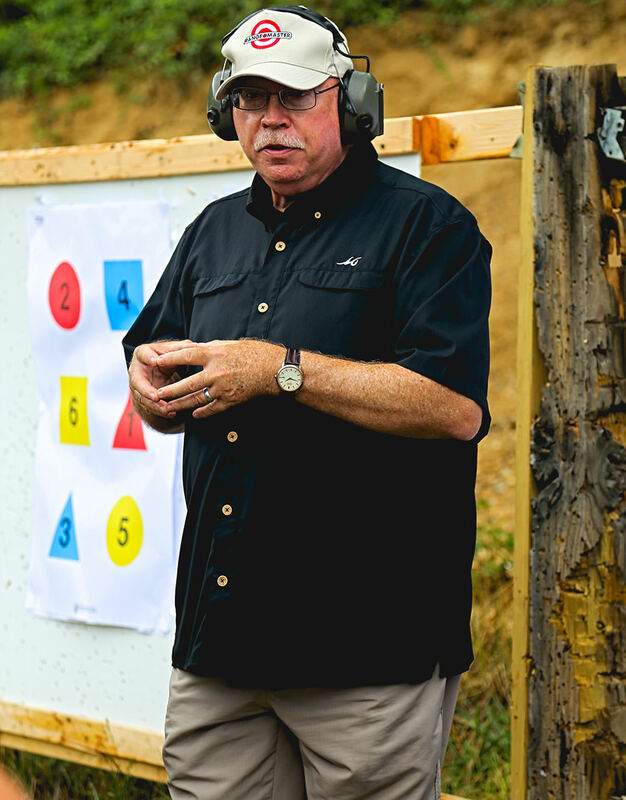 Tom is so confident in his approach that he offers Expert Witness Services for those who may need him to come to court and explain the concepts he teaches and, potentiality, help defend a good defensive shooting. 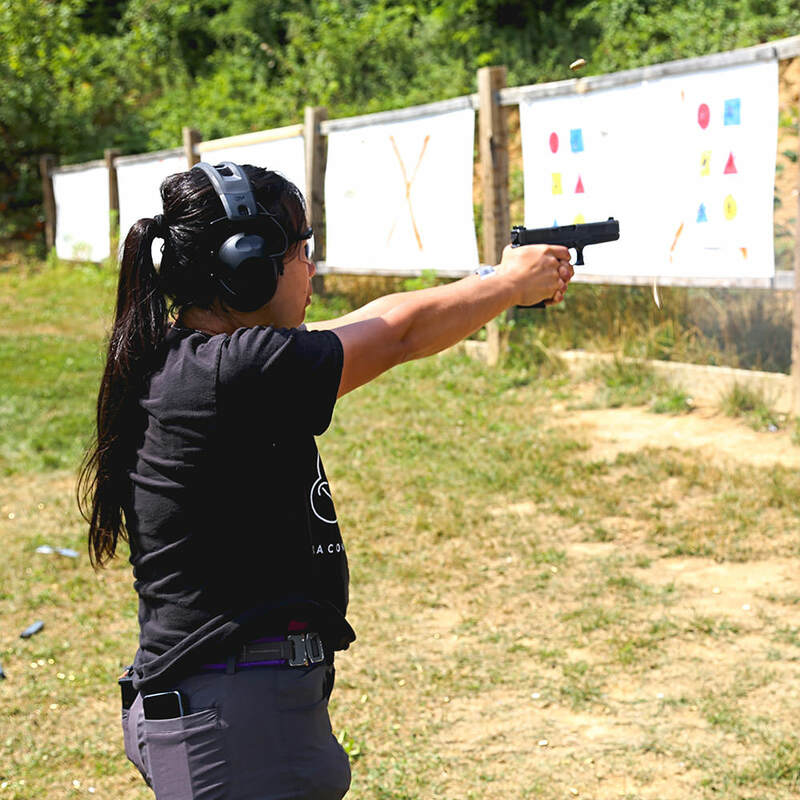 This is very important because there are tons of instructors out there and the number of them willing to show up to court and defend what they teach can be counted on one hand. 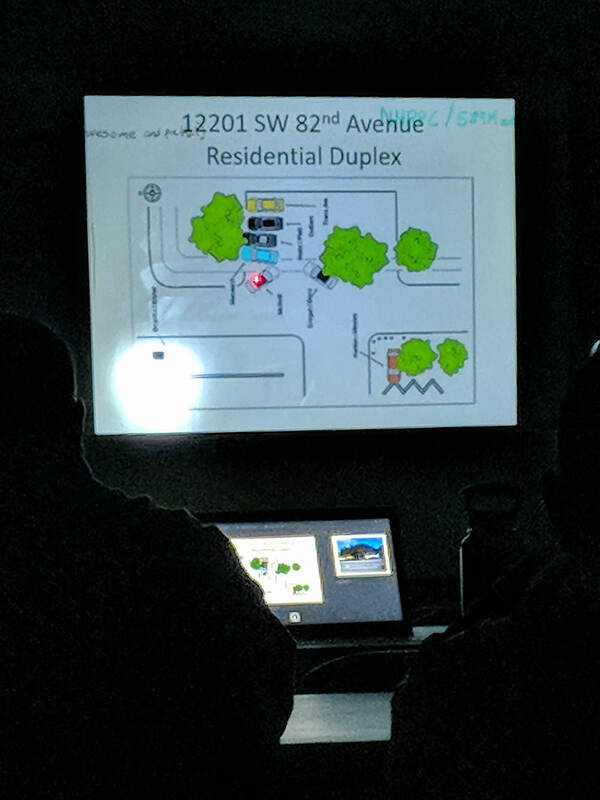 With this class I have primarily taken away two gold nuggets of information which I already knew but heard them phrased differently which illuminated a light bulb for me. 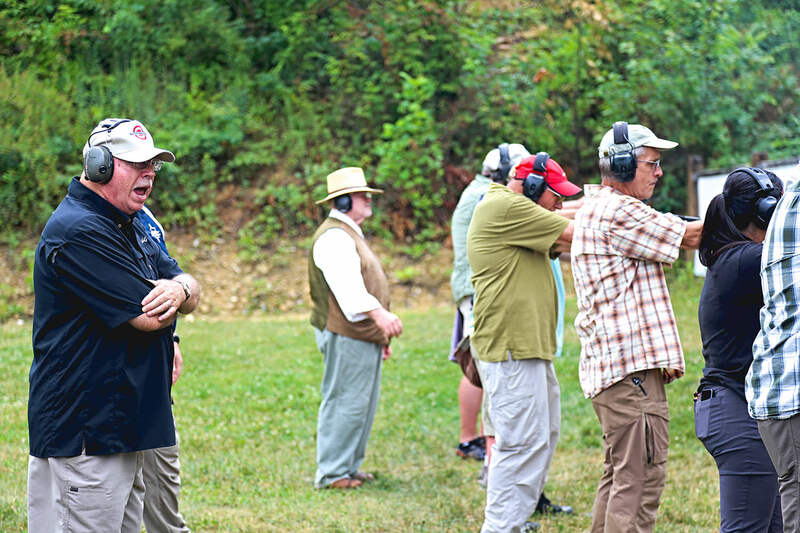 First was Tom's concept of cadence shooting. Now depending on where you stand you may for it or against it. There is a very real world requirement for it in some instances, and understanding the reasoning behind this concept is extraordinarily important. 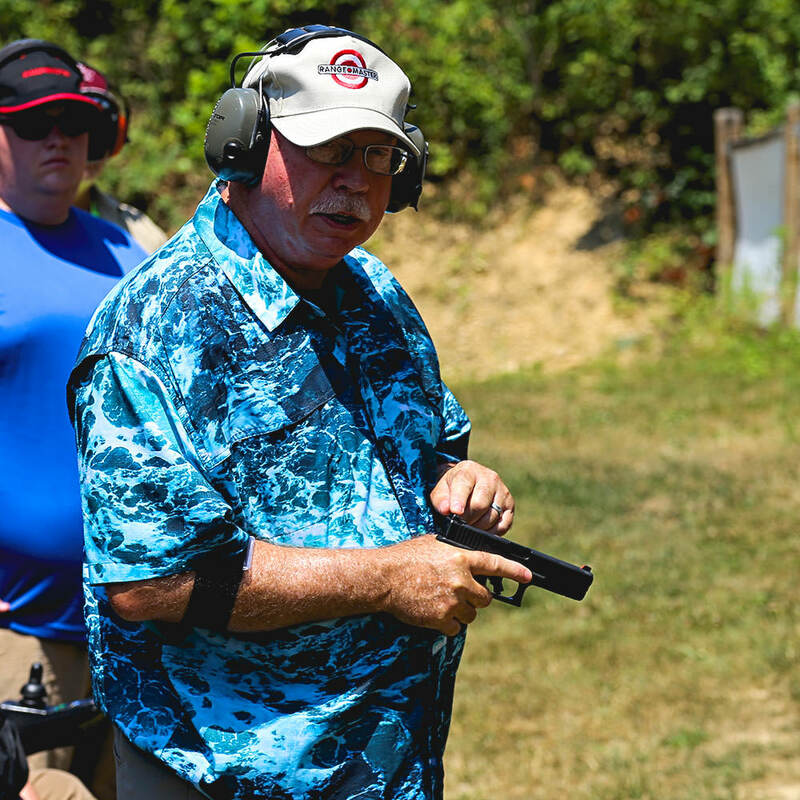 Tom talked about varying speeds of your personal cadence of shooting, full, half and quarter speeds specifically as they apply to distance. Second was his explanation of crime statistics as they apply to real world violence and mass cognitive dissonance. 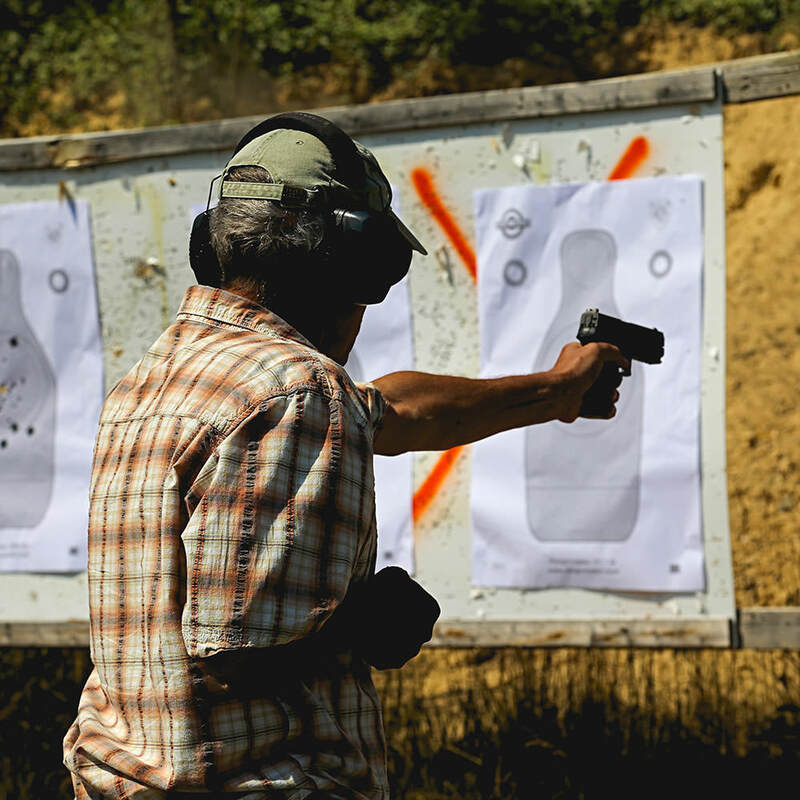 There are simply more violent (often deadly force level) confrontations/interactions everyday than the stats show and the level of disregard for personal safety the average person has is a problem which needs to be solved. 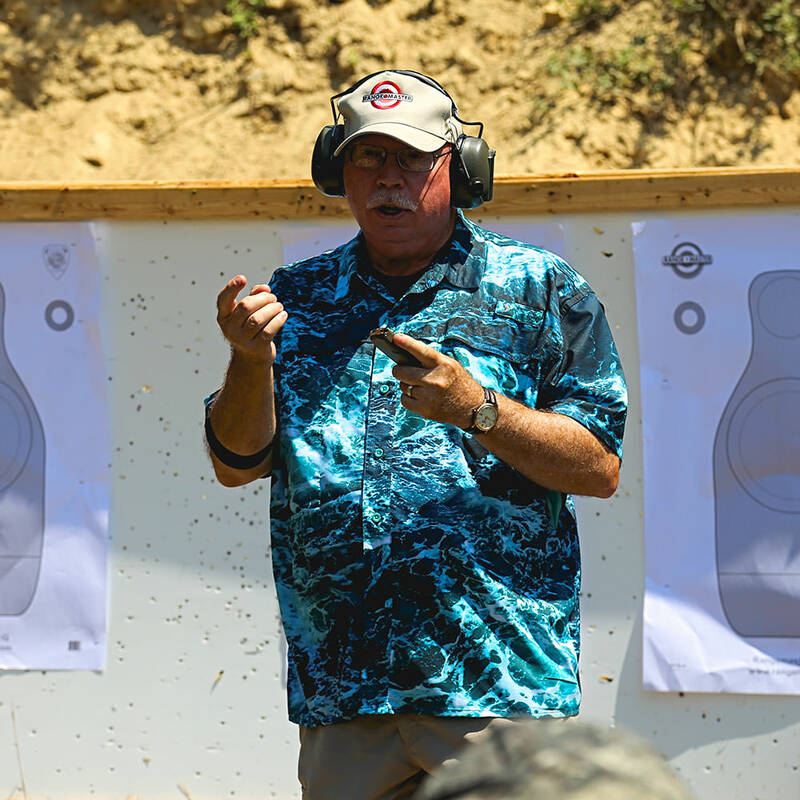 Concepts I already knew, and that we joked about on the range, but Tom explained them in a different way than I have usually heard them, that was very informative. The way Tom is able to approach and install a concept is well thought out and executed very precisely. Having now trained with him, I am looking forward to future classes with him. Honorable mention, Ashton Ray of 360performs.com drove out and AI'd for Tom during the two day class. 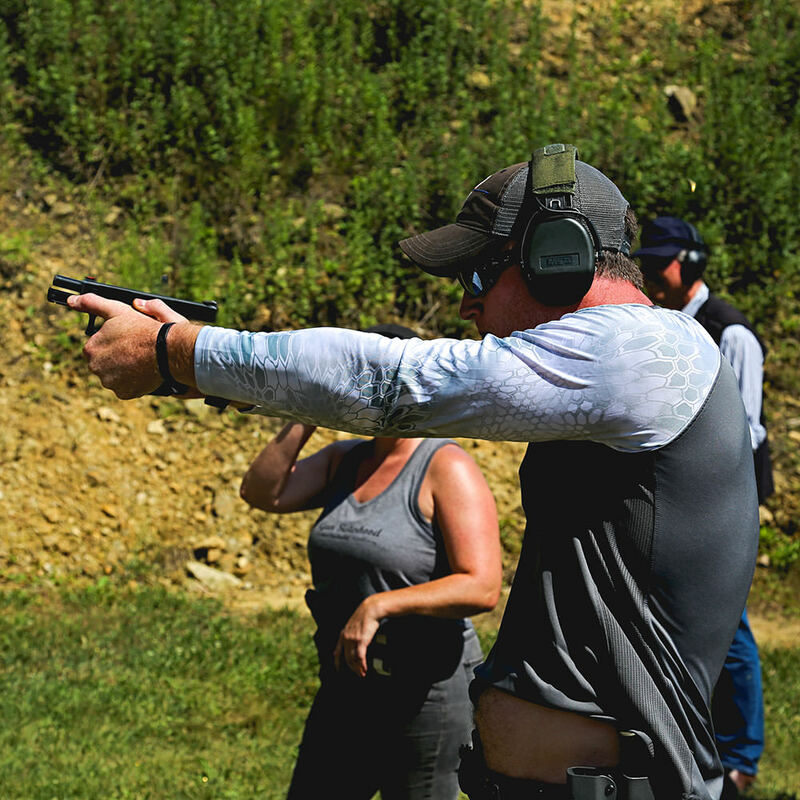 Ashton is an awesome instructor and if you are in or around the Pittsburgh area, and are looking for instruction you should definitely contact him.